Bishop Love is the Ninth Bishop of Albany. He is noted for his unwavering commitment to proclaim the Gospel and sharing the love of Jesus Christ with all who will receive it, and he has a passion for Christian Healing Ministry. He was born and raised in Texas. Following his graduation from Southwest Texas State University with a Bachelor of Arts in Journalism, he serves as an Air Intelligence Officer in the United States Air Force. 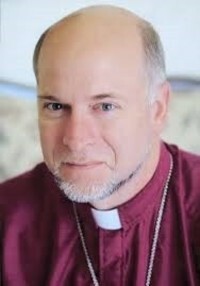 Following his discharge, he earned a Master of Science in Education and following a call to ordained ministry, he attended Nashotah House Seminary graduating in 1991 with a Master of Divinity. He was ordained deacon June 1991 and served as the Dean’s Vicar at the Cathedral of All Saints, Albany, NY. He was ordained a priest in 1991, and later that year, he became Rector of St. Mary’s Church, Lake Luzerne. He served as their Rector for 14 years until his election as Bishop on September 16, 2006. He became the Ninth Bishop of Albany on February 1, 2007. Bishop Love’s ministry and service with the Diocese has included Dean of the Southern Adirondack Deanery; member of the Standing Committee; Diocesan Council; Healing Ministry Team at Christ the King Spiritual Life Center; Greenwich, NY; Priest Associate of the Community of St. Mary, Greenwich, NY; Happening Spiritual Director; and Clerical Deputy to General Convention. He has been on short term mission trips to Uganda, Peru, Bolivia, and until February 2011, he served on the Sharing of Ministries Abroad (SOMA) Board of Directors. Bishop Love serves as the President of Episcopal Charities of Albany and on the Nashotah Seminary Board of Trustees. Bishop Love and his wife, Karen, have been married 32 years and have two grown children, Chris (Lauren) and Catie (Doug) and have two grandsons, Peter and Caleb.